Sara Tavela (email: stavela@misericordia.edu) holds a doctorate from Duquesne University and is currently Visiting Assistant Professor of English at Misericordia University in northeastern Pennsylvania. Her research and teaching focus on British literature and culture of the long eighteenth century. Unlike the lingering image constructed by her brother Henry in the biographical notice in her final publication and her nephew James Edward Austen-Leigh in his memoir, Jane Austen was not a pseudo-cloistered spinster—she was very much in the world, as Emily Auerbach, Penny Gay, Laura Engel, and Paula Byrne have noted. Austen was present and interested in what the world, and especially the world of fashion, had to offer. Though she may describe her novels as “the little bit (two Inches wide) of Ivory on which I work with so fine a Brush, as produces little effect after much labour,” she creates a microcosm of the world’s cultural and social facets (16–17 December 1816), showing her scope to be anything but limited. Austen’s scope within the letters is similarly broad, as demonstrated by the many roles she fills: Jane Austen was a bargain hunter, a fashion critic, a seamstress and embroiderer, a consumer of fashion and accessories, a social commentator, and, most importantly, a sister who illuminates the world and its intricacies in the way that only she can. Within Jane Austen’s 161 surviving letters are almost 150 references to matters of fashion; mentions of accessories comprise approximately one quarter of that total. These figures convey the importance that sartorial matters have to Jane Austen’s correspondence, particularly the letters to Cassandra, where most discussions of fashion take place. Accessories are a conversational focus that connects the Austen sisters. The noticeable presence in the letters of accessories—their making, decorating, sharing, and wearing—shows the Austen sisters continuing the daily routines of their relationship through a shared interest in fashion. These discussions highlight Jane Austen’s connection to Cassandra and the intimacies of their relationship. Though we know that Cassandra destroyed many of the letters, those that remain contain many discussions of fashion and accessories, indicating that these types of discussions are commonplace within her relationship with Jane. Accessories are a means through which the Austen sisters are able to affirm their closeness and perform the rituals of their relationship even when they are not physically together. There is no mistaking that the Austen sisters were close. Jane Austen’s many biographers detail the profound relationship between Cassandra and Jane, who lived together during the bulk of Jane’s life, sharing daily intimacies as sisters and housemates. Despite recognizing that Jane and Cassandra were very close, readers still desire, as Juliette Wells suggests, to know more about the Austen sisters’ relationship and what it actually looked like. The letters, especially the sisters’ accessories discussed within them, make their relationship more visible and tangible. In reading the letters through the lens of accessories, the little rituals of the Austen sisters’ relationship come alive. Accessories, for the Austen sisters, function as a secret language of sorts; accessories ornament their lives as much as they enhance their relationship when together and apart. Accessories yield a lot of power in the Austen sisters’ relationship, and their significance seems to have developed early. Written between 1787 and 1790, “The Beautifull Cassandra” serves as early evidence of the Austen sisters’ joy in accessories or, at the very least, evidence that a fashionable accessory can spur “‘a day well spent’” (Minor Works 47). Falling in love with, purloining, and donning an “elegant Bonnet” sparks a day of exhilarating adventures for the character Cassandra, displaying the influence that an accessory can exert in a female’s life (45).1 The bonnet facilitates the beautifull Cassandra’s freewheeling adventures on her day out: it fashions her appearance as a woman of means, makes her elegant enough to be acknowledged by a viscount, emboldens her to eat copious ices, and finally serves as payment for a joyride to the fashionable Hampstead (45–46). As an homage to Jane Austen’s sister, “The Beautifull Cassandra” is a comical and outlandish gift, both in the story itself and the effusive dedication to Cassandra that precedes this “NOVEL IN TWELVE CHAPTERS” (44). Jane dedicates the narrative to the “Phoenix” Miss Austen, extolling Cassandra’s “taste,” “Sentiments,” and “Virtues” as a paragon of fashion and style (44). Tellingly, the dedication is made “by permission” (44): Jane states that she consulted her sister for approval, and perhaps Cassandra expected nothing less of her younger sister than an outrageous tale full of fun and a fantastic, “elegant Bonnet” (45). Jane Austen’s sprightly and cheeky “The Beautifull Cassandra” uncovers Austen sisters’ great pleasure in accessories as well as in each other. While discussions of fashion in the letters retain the irony of her novels and juvenilia,2 her discussions of fashion are no less thoughtful for their playfulness. As Paula Byrne and Laura Engel remark, Jane Austen is serious about her fashion: she is fascinated by it, and her zeal for it comes through when she is self-fashioning and consulting with Cassandra on matters of fashion.3 Jane’s responses to Cassandra’s suggestions for designing and improving her accessories and gowns denotes Cassandra’s similar interest in fashion. Suzanne Juhasz observes that “[b]onnets and balls form the fabric of Austen’s life” (86), and Jane Austen’s letters amply reveal her consistent interest in other peoples’ lives and sartorial selections. When bringing events to life for her absent sister, Jane Austen notes the fashion choices of her peers and how these choices affect their appearance, for good or ill: “Mrs Powlett was at once expensively & nakedly dress’d;—we have had the satisfaction of estimating her Lace & her Muslin” (8–9 January 1801). Just as fashion can provoke sarcasm and gossip, Jane is also aware that fashion can improve one’s impressions of people, such as when she notes of the morning callers Mrs. and Miss Holder, “It is the fashion to think them both very detestable, but they are so civil, & their gowns look so white & so nice . . . that I cannot utterly abhor them” (21–22 May 1801). Here Jane reveals the dual meaning of “fashion,” pointing to its connections to cultural and social codes, as well as its relationship to clothing and accessories. She is aware of the significant social power of fashion; in the case of the Holder ladies and their “so white” gowns, Jane begrudges her ability to not properly “abhor” them because of her appreciation for their civility and fine clothes. Merging matters of gossip and fashion, the two main topics that occupy her letters to Cassandra, Jane Austen showcases both her interest in dress and its social impact. Further, Jane’s acumen in sartorial matters translates into her genuine enjoyment of fashion and accessorizing. Accessories receive dedicated attention in the letters, with mentions of gloves, bonnets, hair, and jewelry comprising the bulk of the fashionable discussions. Gloves receive primary attention in Austen’s letters to Cassandra. In the earliest existing letter, Austen notes that “all my money is spent in buying white gloves and pink persian” (9–10 January 1798). Gloves confine the physical body, yet they also draw attention to the hands, showcasing the delicacy of a woman’s hands through their light color—typically white or a similar tone. Jane writes to Cassandra about newly purchased pale gloves: “I have unpacked the Gloves & placed yours in your drawer.—Their colour is light & pretty, & I beleive exactly what we fixed on” (27–28 October 1798). Jane here establishes the relationship between her sister and herself through an accessory. By “unpacking” the gloves, Jane reveals the invisible rituals of her relationship with Cassandra: they discuss, plan, and select accessories, activities that bind them closer together and reinforce the intimacies of their daily relationship. Jane draws Cassandra into the moment of sorting out their gloves—having “placed” Cassandra’s “light & pretty” pair in her “drawer” and her own “Gloves” into her own drawer—and recalls their fixing on the color. In this moment, not only gloves are “unpacked” but the sisters’ typical interactions as well. Accessories—in this instance Jane and Cassandra’s pairs of gloves—tie the sisters together as they daily enact their relationship. As Austen writes of gloves, she also alludes to their inherent function of enclosing the hands, which in turn serves as proxy for Jane’s physical presence for the letter-reader and of Cassandra’s presence to Jane. When Jane mentions their gloves, Cassandra can remember her sister’s hands inhabiting the gloves, just as Jane can remember the same through Cassandra’s stowed gloves. Each sister’s hands perform daily tasks, embrace loved ones, and write the letters (and, in Jane’s case, novels) that the recipient reads, thus serving an inestimable function. Hands as a referent, then, invoke the traces of Jane’s and Cassandra’s physical presence and serve to tacitly reinforce the emotional bond between the sisters. Thinking of Jane’s hands enveloped by the gloves, Cassandra can imagine Jane with her, and Jane can do the same. Fashion serves as a point of connection, both physical and imaginative for the sisters. Austen is careful here to delineate the variety of ornamentation she has seen on hats, making sure Cassandra has all of the latest information on trends; she notes what she has seen around town on women’s hats and what she has seen available at markets that has not been used on hats she has seen. By including pricing, she denotes her concern with moderation in financial matters, a marker of her status as single woman who, like her sister, is on a fixed income. Jane demonstrates affection for her sister through the mention of the “quest” that she will undertake to find Cassandra prime hat adornments at a reasonable price. Because hats were typically purchased from the milliner without ornamentation, ladies would adorn their hats with individual touches and decorations. At this time, fruit and other natural adornments are favored, suggesting that the hat wearer’s beauty is as natural as her hat’s ornaments. Austen later notes, however, that she thinks “that it is more natural to have flowers grow out of the head than fruit” (11 June 1799). Jane’s amusing comment about flowers points out the inherent absurdity in supposing that either flowers or fruits could naturally grow out of “the head,” and she likely provokes a laugh from her sister, whom she has before lauded as “the finest comic writer of the present age” (1 September 1796). Jane chats with Cassandra in this letter just as she might in person with pauses for thoughts using dashes and providing a list of fashionable information that keeps Cassandra in the loop regarding all things hats. In the same letter in which she notes fruit and flowers as au courant for bonnets, Jane also reinforces the sisters’ shared decision-making process, declaring: “I cannot decide on the fruit till I hear from you again” (11 June 1799). Jane ensures that Cassandra shares in choosing what will look best on her hat, just as they would do when together. I still venture to retain the narrow silver round it, put twice round without any bow, & instead of the black military feather shall put in the Coquelicot one, as being smarter;—& besides Coquelicot is to be all the fashion this winter.—After the Ball, I shall probably make it entirely black. Austen describes a rather smart and jaunty cap in terms of its adherence to current trends. Coquelicot, a red color so named for French wild poppies, was highly popular at this time, because it commemorated the war hero Nelson’s Nile Campaign (Downing 50–51). The following day Jane is still absorbed in her cap and its trim: “I have changed my mind, & changed the trimmings of my Cap this morning; they are now such as you suggested” (18–19 December 1798). This moment proves highly indicative of the Austen sisters’ shared ritual of hat trimming. Further, this process of consultation and advice is continued in letter form when they are apart, thus allowing them to maintain the regular dynamics of their relationship. Jane returns to this particular hat trimming moment five days later: “My black Cap was openly admired by Mrs Lefroy, & secretly I imagine by every body else in the room” (24 December 1798). Clearly, Cassandra’s advice was well-heeded, and Austen’s pride in her cap is amusingly palpable. Trimming her cap is clearly serious business, though her accounts are also tinged with humor over Jane’s changeability and feminine pride. Cassandra would likely also find pride and amusement in this moment.5 These references to current fashions for bonnets connect Jane Austen with her sister on a subject that impassions and entertains them both. Jane’s many mentions of ribbons, fabrics, flowers, and fruits for bonnet decorating illustrate an enthusiasm for improving her headwear and demonstrate a sisterly bond that cannot be weakened by separation. 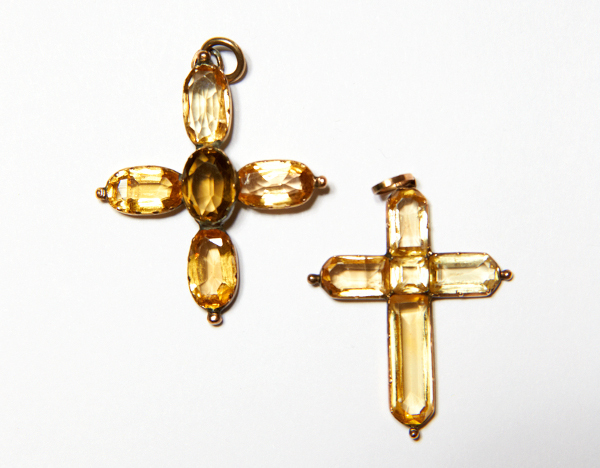 Topaz crosses belonging to Jane and Cassandra Austen. ©Jane Austen’s House Museum, photograph by Peter Smith. A shared subject of interest and conversation when Jane and Cassandra were physically together, the shared concern for fashionable accessories in the letters provides moments of connection for Jane and Cassandra when apart. Jane Austen’s presence is felt in her wit and enthusiasm in noting current fashion trends and the material objects that traverse the spaces between the households that the sisters inhabit; these artefacts connect them through space and time and bolster their sisterly bonds, even suggesting connections between their physical bodies. The language of fashion and accessories is the vehicle through which the Austen sisters maintain the intimacy of their relationship when miles separate them. 1Jill Heydt-Stevenson views the character Cassandra in “The Beautifull Cassandra” as one unconstrained by the “smallness . . . of most women’s lives,” because Cassandra claims the freedom normally denied to women in the eighteenth century (92). She suggests that Cassandra the “phoenix . . . rises from the ashes” of social expectations placed upon women as the vital, unrepentant adventurer Cassandra of the tale (90). Belisa Monteiro contends that the freedoms that Cassandra enjoys stem from her being a “female rogue” akin to the picaresque hero (129); this Cassandra is a “carefree seeker of self-satisfaction” (131). For John C. Leffel, this roguery results in “aggressive female rebellion” that flies “in the face of [the] systemic cultural repression” that Jane Austen frequently confronts in her juvenilia (189). I view the impetus for this mobility and freedom Cassandra enjoys, however, as the bonnet; through that bonnet—a transformative accessory—Cassandra is able to embark on a day full of journeying and enjoyment, reinforcing the significance of accessories for Jane and Cassandra Austen. 2James Thompson, Judith Wylie, Barbara Benedict, and Timothy Erwin all discuss the various shades of irony that Austen attaches to ashion in her novels, such as Henry Tilney’s inquiries about muslin in Northanger Abbey and Robert Ferrars’s extravagant toothpick case in Sense and Sensibility. 3Susan Allen Ford speaks to Jane Austen’s interest and “pride” in self-fashioning, noting that “Austen’s letters show an acute awareness of clothing’s construction of the self” (219). Further, Mary Hafner-Laney observes the “veritable treasure trove of fashion gossip” in the letters, observing how “Jane delights in sharing her observations and enjoyment of the latest fashion trends with Cassandra” (136). 4The full passage exposes a very younger-sister moment, in which Jane borrows Cassandra’s cap in order to assess her own: “I took the liberty a few days ago of asking your Black velvet Bonnet to lend me its cawl, which it very readily did, & by which I have been enabled to give a considerable improvement of dignity to my Cap, which was before too nidgetty to please me” (18–19 December 1798). 5Suzanne Juhasz and Jan Fergus also note the humor of the letters, particularly the elliptical nature of the letters to Cassandra; this shorthand form of discourse points to inside jokes the sisters shared and the knowledge they would have had of each other’s communicatory modes. Maggie Gover similarly perceives the presence of inside jokes in the letters, saying that Austen “anticipated her reader’s reactions to her remarks” (14). Further, as Carol Houlihan Flynn observes, “Cassandra presides over the letter as its most adroit reader, providing the hidden knowledge that is not allowed into the text” (108). 6Sarah Downing speculates on this matter of the gift as well, stating that Austen “must have been pleased because she commemorated the occasion by having Fanny Price [in Mansfield Park] receive a topaz cross from her brother William in similar circumstances” (59). 7As Marcia Pointon suggests, jewelry has “an emotive content” (11). 8Barbara Benedict likens Mansfield Park’s echo of the Austen sisters’ crosses with Fanny’s cross as evidence that “Austen’s own life was inhabited by things that fused personal, social, and symbolic meanings” (350). Similarly, Kristen Miller Zohn defines the possible affective ties to tangible objects, specifically to portrait miniatures: like other types of jewelry, portrait miniatures serve as markers of love. Auerbach, Emily. Searching for Jane Austen. Madison: U of Wisconsin P, 2004. Austen, Jane. Jane Austen’s Letters. Ed. Deirdre Le Faye. 3rd ed. Oxford: OUP, 1997. _____. The Works of Jane Austen. Ed. R.W. Chapman. 3rd ed. Oxford: OUP, 1933–1969. Batchelor, Jennie, and Cora Kaplan, eds. Women and Material Culture, 1660–1830. New York: Palgrave, 2007. Benedict, Barbara A. “The Trouble With Things: Objects and the Commodification of Sociability.” A Companion to Jane Austen. Ed. Claudia L. Johnson and Clara Tuite. Malden, MA: Wiley, 2009. 343–54. Castle, Terry. “Sister–Sister.” London Review of Books 3 Aug. 1995: 3–6. Downing, Sarah Jane. Fashion in the Time of Jane Austen. Oxford: Shire, 2010. Engel, Laura. Austen, Actresses, and Accessories: Much Ado About Muffs. Basingstoke: Palgrave, 2015. Erwin, Timothy. “Comic Prints, the Picturesque, and Fashion: Seeing and Being Seen in Jane Austen’s Northanger Abbey.” Women, Popular Culture, and the Eighteenth Century. Toronto: U of Toronto P, 2012. 202–22. Fergus, Jan. “‘The Whinnying of Harpies?’ Humor in Jane Austen’s Letters.” Persuasions 27 (2005): 13–30. Flynn, Carol Houlihan. “The Letters.” The Cambridge Companion to Jane Austen. Ed. Edward Copeland and Juliet McMaster . Cambridge: CUP, 1997. 115–30. Ford, Susan Allen. “‘To Be above Vulgar Economy’: Thrifty Measures in Jane Austen’s Letters.” Persuasions 30 (2008): 216–21. Gover, Maggie. “‘A Very Pretty Hand’: The Questionable Value of Using Jane Austen’s Letters as a Means of Knowing Austen.” Lifewriting Annual 2 (2008): 1–25. Hafner-Laney, Mary. “‘I was Tempted by a Pretty Coloured Muslin’: Jane Austen and the Art of Being Fashionable.” Persuasions 32 (2010): 135–43. Heydt-Stevenson, Jill. Austen’s Unbecoming Conjunctions: Subversive Laughter, Embodied History. New York: Palgrave, 2005. Juhasz, Suzanne. “Bonnets and Balls: Reading Jane Austen’s Letters.” The Centennial Review 31 (1987): 84–104. Monteiro, Belisa. “Comic Fantasy in Jane Austen’s Juvenilia: Female Roguery and the Charms of Narcissism.” Persuasions 30 (2008): 129–134. O’Brien, Alden. “Achieving an ‘Air of Decided Fashion’: How Austen’s Ladies Adapted the Latest from London.” Persuasions 37 (2015): 106–18. Pointon, Marcia. Brilliant Effects: A Cultural History of Gem Stones and Jewellery. New Haven: Yale UP, 2009. Thompson, James. “Jane Austen’s Clothing: Things, Property, and Materialism in Her Novels.” Studies in Eighteenth-Century Culture 13 (1984): 217–31. Wells, Juliette. “The Closeness of Sisters: Imagining Cassandra and Jane.” Persuasions On-Line 30.1 (2009). Wright, Carrie. “‘Unbearably Fine’: The Socio-Political Powers of Jewelry in Jane Austen’s World.” Persuasions On-Line 36.1 (2015). Wylie, Judith. “‘Do You Understand Muslins, Sir?’ Fashioning Gender in Northanger Abbey.” Styling Texts: Dress and Fashion in Literature. Youngstown, NY: Cambria, 2007. 129–48. Zohn, Kristen Miller. “Tokens of Imperfect Affection: Portrait Miniatures and Hairwork in Sense and Sensibility.” Persuasions On-Line 32.1 (2011).